White and Williams proudly sponsored Philadelphia Futures’ 2018 Get in the Game, an event to support the college aspirations of Philadelphia’s low-income, first-generation college students. The event, which took place on Thursday, April 26, 2018, was a celebrity bowling tournament featuring competitive teams, sponsored by businesses and individuals and led by Philadelphia Phillies players and local media celebrities. 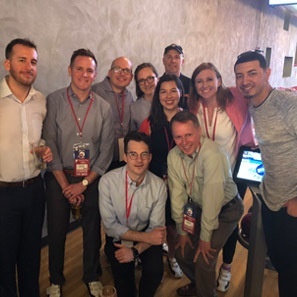 Several lawyers, including partner Daryn Rush, who has been involved with Philadelphia Futures as a mentor, teamed up with celebrity team captain and Phillies pitcher Vince Velasquez to participate in the tournament. The firm's sponsorship of the event will assist first-generation college students in accessing tools, resources and opportunities necessary for admission to and success in college. White and Williams is committed to furthering its deep involvement in its local communities, and supporting charitable and public interest causes.